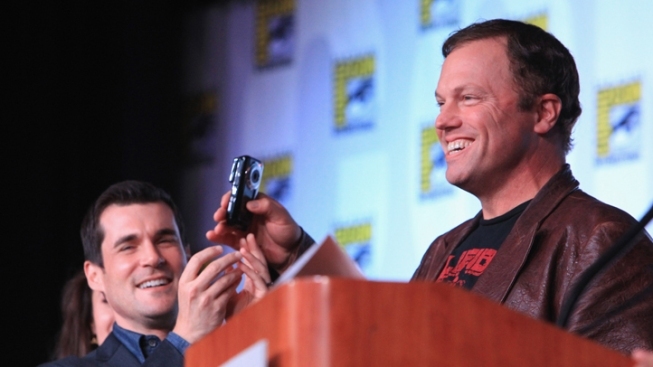 “Firefly” panel brings thousands of fans even after the show has been off air. Where were these fans a decade ago? Cast and crew members Alan Tudyk, Jose Molina, Joss Whedon, Nathan Fillion, Summer Glau, Tim Minear, Adam Baldwin, and Sean Maher were welcomed with a full room of standing ovation. Dave McCormick, a die hard “Firefly” fan had waited in line since 7:30 a.m. to hope to get a good spot inside. “I hope I get a good seat because I have been following them for years and out of all the Comic-Con panel choices to see, this was on my top.” McCormick said. He wanted to see the real faces that gave such a unique blend of character to this space western series. “Even though reality tells us this will never pick up again, I still hope that it will come back.” McCormick said. As cast and crew members from “Firefly” share their most memorable moments on and off set, they become quite emotional. Director Joss Whedon spoke to the fans as he shed tears. "When I see you guys, I don't think the show is off the air. I don't think there's a show. I think that's what the world is like. I think there are spaceships, there are horses, and our story is alive." Whedon said. The fan community never gave up and neither did Joss.